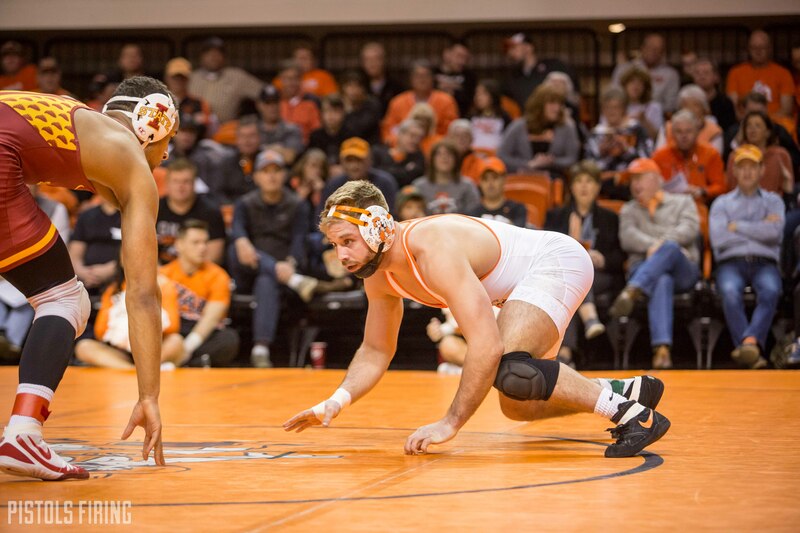 In the first weekend homestand for Oklahoma State all season, OSU will wrestle 16th ranked-Northern Iowa on Friday in Gallagher-Iba Arena at 7 p.m., and then follow that with another tough test on Sunday with 22nd ranked-Lehigh at 1:30 p.m.
OSU will be the favorite in both these duals. Barring UNI winning every single toss up it’s hard to see where either team could knock off the Cowboys at home. There are some massive individual matchups here, though, and for my preview I felt it best to take a look at some of those. Going into the season I think most would have favored Kaid in this one. Brock has taken some losses, though, and Alber has wrestled incredibly well to this point. Alber’s only losses have come to top 10 guys and he’s beaten some big names this year. Kaid is an incredible wrestler and certainly has the ability to win here, it just hasn’t quite come together for him up at 141 yet this season. This would be a huge win for Kaid both for seeding at the Big 12 tournament and for a bit of confidence going toward the postseason. This is one I have circled on my calendar. Kaden has a flashy style that, win or lose, is a lot of fun to watch and these Northern Iowa guys always seem to wrestle with a bit of a similar edge. That makes for what should be a very good match. Thomsen is an All-American and split with Boo Lewallen last year. This one may or may not happen. Chandler has been out with injury for a bit, but he weighed in at 165 last week vs. Iowa State. He did not wrestle. I know he’s close to being back and we may see him here. If he is, this is a good one. Joe Smith has a tough weekend ahead of him. Lujan on Friday followed by Kutler on Sunday. Lujan was the Big 12 champion at 174 last year and will be a very tough test for Smith. Both J. Smith’s on the OSU roster have a tough weekend ahead of them. Jacobe has been wrestling well though and seems to be making the right adjustments to this new weight class now. Foster is a huge test and a win here would be massive for Jacobe. Now let’s preview the matchups against No. 22 Lehigh. Not sure who the Cowboys will send out here. They’ve had to toy with the lineup a bit due to some injuries and we’ve seen Jonce Blaylock, Wyatt Sheets, and Andrew Shomers all here at various times. Whoever it is needs to win. This is the only spot where it looks like the Cowboys may still need to do some work to qualify for the NCAA tournament. Two absolutely massive matchups for Joe Smith this weekend with Kutler and Lujan. Joe has passed some big tests this year and his only loss on the season came to NCAA champion Mark Hall. This will be an opportunity for Joe to avenge a, loss though. In their only college meeting Kutler beat Joe Smith 7-1. If your initials are J. S. you better be ready to go this weekend. Both Smiths have two very tough matchups. A weekend sweep for Jacobe would be huge. A big 3-2 win over Jordan Wood was part of Derek White’s coming out party as a heavyweight last season. Wood is very good, but Derek White has continued to improve since last season and has solidified himself as one of the top heavyweights in the country. This will be a solid test for White. Barring UNI winning every single close match, OSU should win both these duals, but all these matches are significant. The Cowboys also have a chance to break an attendance record this year. They’ll need good crowds this weekend to do it. If you can’t make it to Gallagher Iba Flowrestling will be streaming and you can listen on Stillwater Radio.